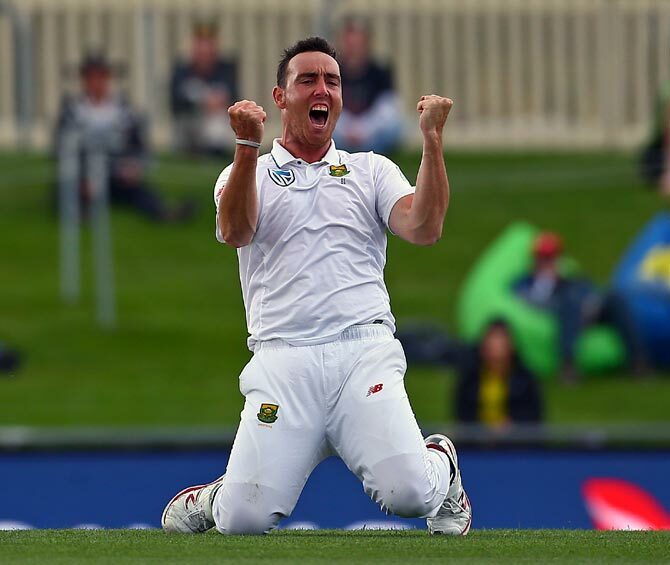 Replacement paceman Kyle Abbott took 6-77 as South Africa completed an innings and 80-run humiliation of Australia the second Test in Hobart on Tuesday to seal the three-match series with a game to spare. 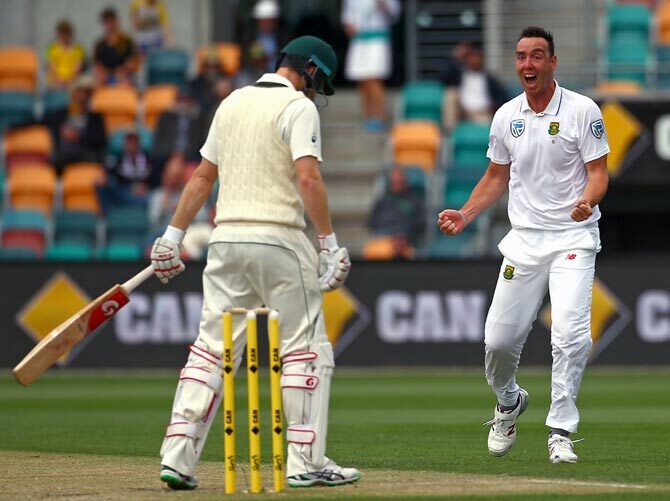 Handed a rare opportunity with Dale Steyn injured, the 29-year-old Man of the Match grabbed four wickets in the morning at Bellerive Oval as Australia lost eight wickets for 40 runs and were dismissed for 161 before lunch on day four. 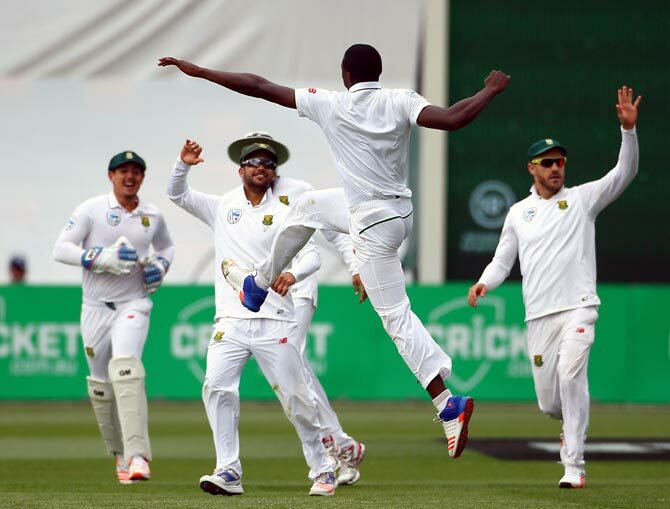 Resurgent South Africa, who won the series-opener in Perth by 177 runs, will head into their first day-night Test match in Adelaide next week confident they can sweep their demoralised opponents. "All our bowlers were exceptional," said Faf du Plessis, triumphant as stand-in captain for the injured AB De Villiers. "But I'm so happy for Abbo (Abbott), he's a guy that most of the time sits on the side because of the great bowlers we have but every single time he gets an opportunity he puts his hand up. "To come here and do it 2-0, is special for us as a team ... I'm just really proud of the way the team is moving forward." It was South Africa's third straight Test series win in Australia after their 2008 and 2012 successes. Australia face another bout of soul-searching, having slipped to a fifth consecutive Test defeat after losing the first match of the home summer for the first time in 28 years in Perth. Following a 10-86 collapse in Perth and the 85 all out in the first innings in Hobart, Australia's batting was again culpable despite the quality bowling and the tricky conditions on an overcast day. "We’ve got to find a way to be a bit more resilient and spend some time out in the middle," said Australia captain Steve Smith, who was out nicking behind for 31. "It wasn’t the way we planned it, credit to South Africa I thought they bowled beautifully again this morning." Abbott, who dismissed both Australia's openers on day three, triggered the collapse by coaxing Usman Khawaja (64) into chasing a wider delivery, which the batsman nicked to wicketkeeper Quinton de Kock. That ended a 50-run partnership with Smith and brought Adam Voges to the crease on a pair of ducks for an innings that many thought would save or end his Test career. The number five batsman was out for two, in two minds facing an Abbott delivery which he parried to the slips with an ugly, aborted pull-shot. 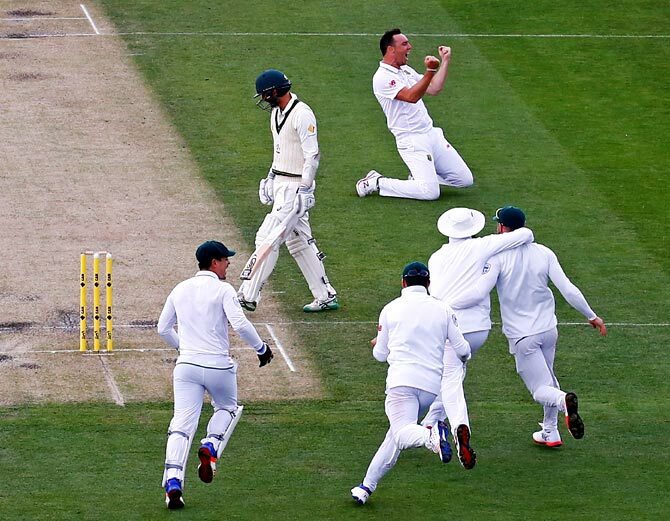 From there, the wickets tumbled, as Kagiso Rabada (4-34) joined the feast. Debutant number six Callum Ferguson, who ran himself out for three in the first innings, managed one run before trying to duck a Rabada delivery only for the ball to stay low and ping off his glove to Dean Elgar at third slip. The 21-year-old seamer then had Peter Nevill caught behind for six with a ball that reared up on the wicketkeeper and trapped Joe Mennie lbw for a duck before dismissing captain Smith. 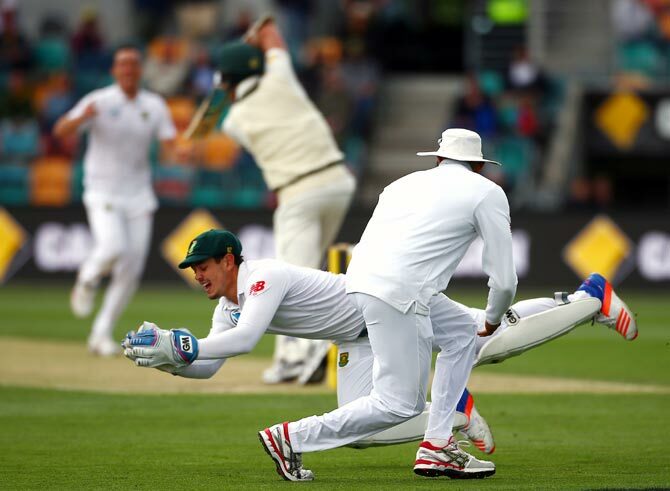 De Kock, who scored a decisive century in South Africa's first innings 326, took his fourth catch of the second innings when Abbott returned to remove Mitchell Starc for a duck. The buoyant paceman wrapped up the innings when Nathan Lyon (4) spooned a simple catch to Vernon Philander at mid-on, sparking celebrations from his team mates and leaving the small home crowd stunned.